Rachel Bomberger is the copywriter at Eerdmans. She loves reading, writing, and egg salad sandwiches. As a child, I loved Easter. I still do. Despite all the extraneous chicks and bunnies, Holy Week is still somehow less secular, less muddied by commercialism, and more wholly sacred than Christmas. It’s filled with soul-quenching darkness and dazzling light. It’s adorned with palms, shrouds, and lilies. It’s accompanied by some of the greatest hymns in the church’s treasury. It is the time when Christian faith is for me the most raw — the most real. Christ has died. Christ has risen. Simple. Perfect. Utterly astounding. As a pastor’s wife, though, I dread Holy Week. I’ve hardly seen my husband since last Saturday. He’s been busy working fourteen-hour days to prepare for the marathon of two or three services each day on Maundy Thursday, Good Friday, and, of course, Easter Sunday. The whole ordeal leaves me so tired that when we finally make it to the high points of all these marvelous services — the glorious Gospel accounts of Jesus’ death and resurrection — the words too often sound flat and tinny to me (that is, if I can hear them at all over the fidgeting of my church-weary youngsters). They certainly don’t sink down deep into my very core the way I know they should. 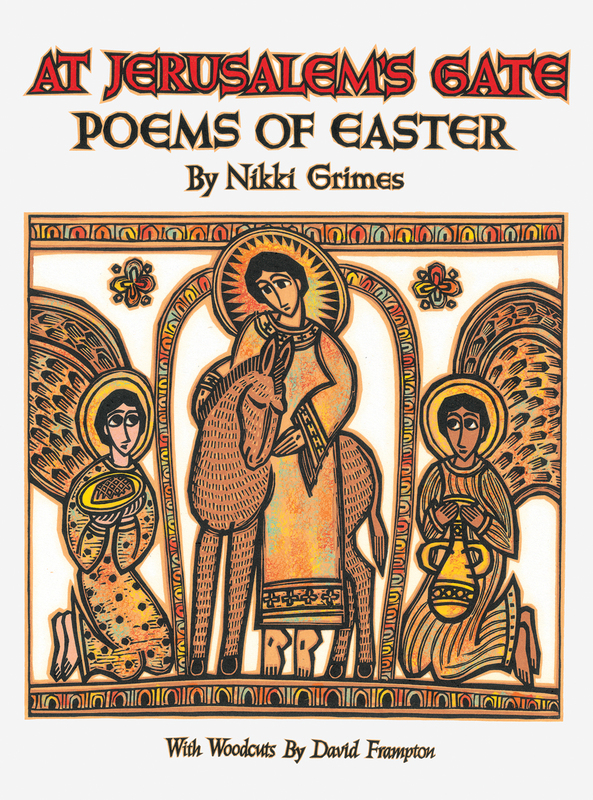 This year, though, as I prepare to hear the blessed Gospel narratives yet again, I’ve had help from an unexpected source: Nikki Grimes’s At Jerusalem Gate: Poems of Easter. It’s a children’s book (technically speaking), though not one that I’ll be ready to share with my own children until they’re a little older. The book’s descriptive copy says it’s best suited for children aged nine to fourteen, and I think that’s apt. For now, then, I’m the child chewing on Grimes’s simple verses and drinking in David Frampton’s expressive woodcuts. Frampton’s illustrations are only deceptively plain. He works within a limited palette of warm, sandy, Mediterranean hues, punctuating them with thick black outlines and startling patches of white. At first glance, all his figures look the same; all feature the same oversized, heavily lidded eyes, the same curving postures, the same angular faces. Yet — by some miracle of nuance — those eyes and postures speak volumes, expressing the whole range of human emotions, from Palm Sunday hope and heaviness, to Good Friday anguish, to Easter exultation — and helping me look at the story with altered eyes. Grimes’s poems (also deceptively plain) have affected me in an even deeper way. Some rhyme; some don’t. (I personally found the nonrhyming poems more forceful.) Yet all of them plunge me imaginatively into the events of Holy Week, their rhythms and cadences disrupting my tendency to skim across the surface of the familiar story I know by heart. Through the eyes of the disciples, the Sanhedrin, Pilate’s wife, Pilate, Malchus, Simon of Cyrene, and others, I observe Jesus’ last supper, his arrest and trial, and his crucifixion — all in a slightly different light and with fresh immediacy. When I read “Call It What You Will” — about the flogging and mocking (torture, really) of Jesus — I have to close the book and put it aside until my heart stops pounding and my shoulders stop shaking. Reading “The Highwayman” — written with the voice of the thief on the cross — I feel tears well up in the corners of my eyes. By the time I get through “The Last Goodbye” — Mary’s farewell prayer — those tears are streaming down my cheeks as I think about my own small son and the unbearable pain I would have felt in Mary’s place. As I finally make my way through “An Act of Kindness” — where “Christ crucified lay limp / as any son undone / by beating, cross, and spear” and is carried by Joseph of Arimathea to “a place / of rough rock and rest” — I feel a weariness soaking into my bones. Yet this weariness feels very different from the weariness born from a week of too much church and too little husband. Here is a cleansing weariness; an “It is finished” weariness. Peace. That peace carries me through the rest of the poems, where Grimes shows me the shocking miracle of the resurrection as experienced by Mary Magdalene, the disciples on the road to Emmaus, and a Roman soldier. As a poet, Grimes does occasionally take poetic license, adding more details than are strictly available in the Bible narrative. Yet hers is a faithful license, one that probes, questions, interacts, and converses with the Gospel accounts. Like Jacob, she wrestles with the Word. It’s Good Friday now, and I think I’m ready — ready to hear the old Gospel story again for myself, to let it wash over and into me, and even at times, like Nikki Grimes, to wrestle with it. Click here to order At Jerusalem’s Gate: Poems of Easter.